Architectural collections are warehouses of knowledge: they are sources for the history of blueprints and buildings and offer insight and ideas for the designs of tomorrow. However, in the age of computer-aided design, the sketches, plans, and models that used to be available for research and exhibitions are being replaced by bits and bytes on a variety of storage media whose lifetimes have no guaranteed length. How will that change the profile of a classic architectural collection in the time to come? How will the history of architecture be written in the future, and how will exhibitions be presented? The Architekturmuseum at the Technical University in Munich has one of the largest special collections of architecture in Europe. This publication presents its complex history while placing it in the context of other prominent international collections. 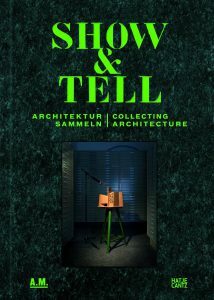 At the same time, selected examples are used to discuss questions about collecting, research, and the exhibition of architecture in the time ahead. This publication is available in German and English.